Evocative use of coloured space there. Am I remembering right, that there was something hinky about the Russian rocket motors in this story? Something to do with boron exhausts, maybe? I might be confusing it with something else. The Russians used ingenious hybrid LOX, solid rubber&lithium-based engines: SRBs that could be throttled. Bova's When the Sky Burned also depicted life off of Earth as bleak and impoverished -- at best -- when not sustained by a constant influx of Earth import. Noted here for being published in 1973. Was there a conversation going on that I wasn't aware of? What other stories of the day used the same scenery? I don't know but now I'm curious. Was the post-Mariner "The solar system isn't like what Weinbaum told us" funk still going then? 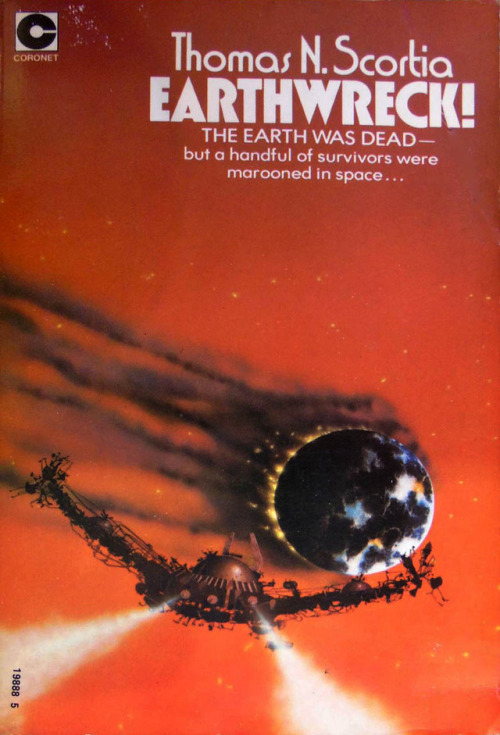 I don't think O'Neill's brand of space positivism really got going until later in the 1970s (O'Neill's "The High Frontier" didn't come out until 1976). I wonder how much nuclear material would have to be released so that going to Mars was preferable to setting up shop back on Earth, after it had died down a bit. You might have to grow food in sealed greenhouses to keep radioactive stuff from being absorbed into food, but hey you'd have to do use sealed greenhouses on Mars, too. And the Mars greenhouses would have to be pressurized. I think it was the Spores of Doom which were the main obstacle to establishing a base on Earth, rather than the radiation.